The Marlboro Man in his adverts in Time Magazine and elsewhere, seemed so real that it was almost like a window into another world rather than an advert. 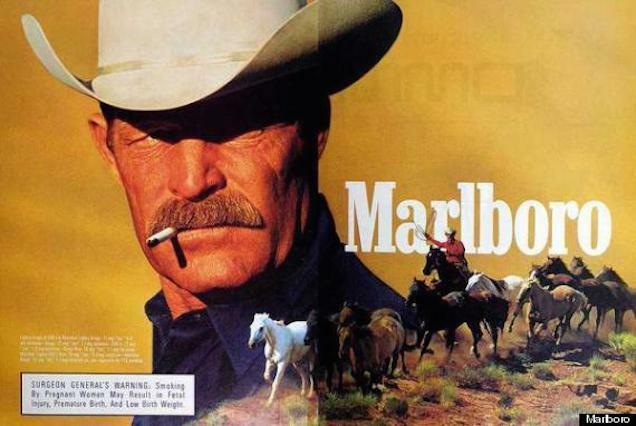 I remember seeing the adverts for Marlboro all over the place at one time, back when it was OK to smoke in public, and back when it was OK to openly admit that you wanted to be one of those rugged Marlboro smoking cowboys. Time used to regularly sport one these adverts just inside the front cover or sometimes on the back. There was a romance to the whole thing that allied smokers with the hard working, hard living frontiersmen of yesteryear. The tide has turned somewhat – CVS recently stopped selling cigarettes, and announced with a campaign that said “We’re quitting, why don’t you?” Supplying their customers with kits for actually giving up the cancer sticks. It’s the dog-end of a slow decline for a section of the advertising industry that used to make big bucks and used to put out some pretty innovative and interesting adverts. The image of the Marlboro man has been culture-jammed and used to advertise anti smoking campaigns – a picture of the iconic figure with a tracheotomy trying to flip the glamor on its head. It never really worked, and the image is still rife with coolness, despite the many health warnings. It was always a little reminiscent of Eastwood with the cheroot hanging from his lip riding around and dispensing justice as the man with no name; it made you think of Philip Marlowe; it called to mind James Dean. It wasn’t just a prop in those movies – it was a philosophy distilled into an object. I say all this and I never smoked more than one cigarette – this is how seductive the mythos of the hard smoker was. Darrell Hugh Winfield, one of the last and one of the longest serving Marlboro men just passed in Wyoming, he was 85. From the late 60s until the late 80s, his rugged looks were the embodiment of what it meant to be a smoker of the Marlboro brand. News of his death signaled the end of an era. You are more likely to see some gruesome anti-smoking ad now than anything actually celebrating a product from the tobacco industry, but the idea is embedded in the culture, and a lot of our heroes and anti-heroes like to light up and fill those dramatic pauses with the very filmic activity of a cigarette burning. Perhaps this week, a few sentimental Marlboro smokers will be sucking in a lungful of cigarette smoke, and as they blow a few smoke rings they will spare a thought for the guy who made the idea of smoking such an attractive one. What advertising icons do you miss or seek to emulate? Are there any advertising campaigns that really have that much power anymore?